Retired Command Sergeant Major (CSM) Alfred L. Whitener Sr., 69, began the next chapter of his journey on Friday afternoon, June 1st, 2018. A father, grandfather, brother, soldier, leader and best friend, Whitener will be greatly missed. Born to Arlene (Gleghorn) Whitener and Howard Whitener in St. Louis, MO on October 1st, 1948, Whitener graduated from O’Fallon Technical High School and enlisted in the army shortly thereafter in 1968. Whitener married Barbara A. Gregory in 1971 in El Paso, Texas and later married Catherine M. Sullivan in Monterrey, California in 1990. 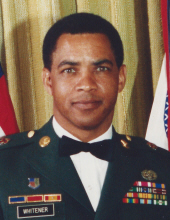 Whitener began his military career of 29 years as a private serving in Vietnam, and retired in 1997 as Troop Command Sergeant Major leading a staff of several hundred at William Beaumont Army Medical Center in El Paso, TX. CSM Whitener led with profound dedication, candor and professional integrity, and was well known for being a soldier’s soldier. In addition to Vietnam, Whitener completed several stateside tours and three overseas tours, two in Germany and one as Troop CSM for United Nations Task Force 131 in Port-Au-Prince, Haiti. His assignments ranged from infantry, combat support hospital, general medical centers, army reserve component support and division level special task force. He served as Combat Medic, Practical Nurse, Wardmaster, Chief Wardmaster, Operations Sergeant and First Sergeant. Whitener was the first ever medical soldier to be inducted into the 7th Infantry Division Elite Organization of the Professional Bayonet. He was a member of the Order of Military Medical Merit and a lifetime member of the Noncommissioned Officers Association. Upon his retirement, the soldiers he served presented him with the sword of leadership. Whitener’s awards and decorations include: Legion of Merit (two oak leaf clusters), Bronze Star, Meritorious Service (three oak leaf clusters), Army Commendation (three oak leaf clusters), Army Achievement (six oak leaf clusters), Army Good Conduct (nine oak leaf clusters), National Defense Service (two oak leaf clusters), Vietnam Service Medal with five bronze service stars, Non-Commissioned Officers Professional Development Ribbon (IV), Army Service Ribbon, Overseas Service Ribbon (III award), Republic of Vietnam Gallantry Cross-Unit Citation with palm, United Nations Medal, Republic of Vietnam Campaign Metal, Expert Marksmanship Qualification Badge with Rifle Bar, Combat Medical Badge, Parachutist Badge, Driver and Mechanic Badge. In his later years, Whitener enjoyed traveling and spending time with his family. He also enjoyed smoking, drinking, and gambling as much as he damn well pleased. Al is survived by four children, Alfred L. Whitener Jr., Anthony L.Whitener, Justin J. Sullivan and Christin M. Whitener. A celebration of life will take place at Stokes, Prock & Mundt (535 S. Hillcrest Parkway) in Altoona on Monday, June 11th, 2018 at 6pm with visitation from 4-6pm. A military burial will follow on Tuesday, June 12th at 12pm in Spooner, WI. "Email Address" would like to share the life celebration of Alfred L. Whitener. Click on the "link" to go to share a favorite memory or leave a condolence message for the family.